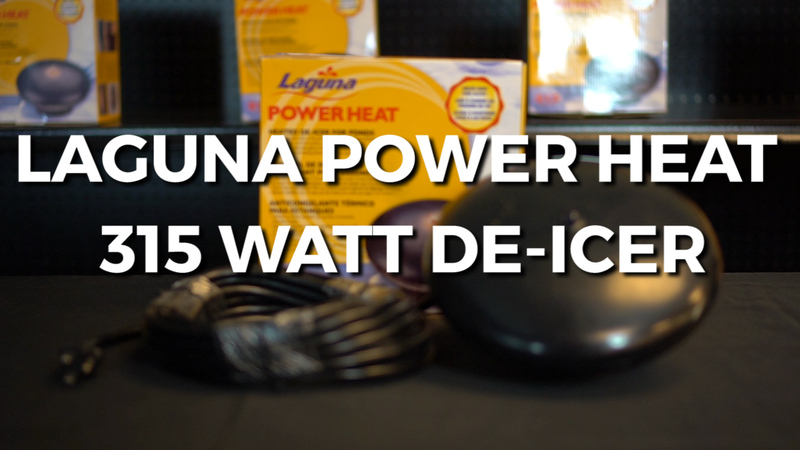 Laguna Power Heat 315 Watt De-Icer Review Without an opening, toxic gases become trapped under the ice and dissolved oxygen slowly lessens and may not replenish. Hi, I'm Joe from webbsonline and today I'm going to review Laguna's Power Heat 315 Watt De-Icer. Maintaining an area free of ice during the winter months is vital to allow for a proper gas exchange. Without an opening, toxic gases become trapped under the ice and dissolved oxygen slowly lessens and may not replenish. Utilizing a pond deicer is the easiest way to prevent fish kill during the winter season. The Laguna Power Heat 315 watt floating Deicer comes with a 22 ft. power cord and is safe for plastic and rubber lined ponds. An integrated thermostat controls its operation. Turning on and off as needed. An included LED light atop the unit shows you when the deicer is on. A neat additional feature is a hook located right on the underside. What this is for is if you're operating a small aeration system - you can actually run the airline thru this hook to where the air stone hangs just below. For additional information on deicers, please don't hesitate to call. 'm Joe from webbsonline. Your TidalWave pump will require periodic cleanings of the cooling screen, rotor and rotor chamber. The Laguna PowerJet offers everything you need to generate circulation with a decorative fountain display. Rock Lids are the best way to cover ugly equipment. They are light, attractive, and easy to use.